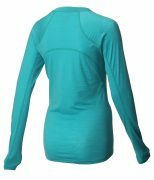 A next-to-skin, long sleeve base layer that wicks moisture away from the torso, while also retaining body warmth on cold days. Merino wool delivers the ultimate in comfort. Stay warm and dry: Natural moisture management system ensures upper body stays warm and dry. Remain protected: Long sleeves, high cut neck and UPF 40+ help protect body from changeable weather conditions. Versatility: Wear as base layer on its own or underneath another garment. Thumb loops provide further option.